Even in the depths of the horrible stretch of critical, commercial, and artistic failures that plagued Walt Disney Productions between 1970 and 1988, there's one spot of true brilliance, although the degree to which The Many Adventures of Winnie the Pooh belongs to that interregnum is debatable. Its roots lie in the comparatively strong period of the 1960s, in fact, for it is nothing but an anthology film put together from three shorts released in 1966, 1968, and 1974, respectively, with about five minutes of new material created to link the three miniatures together in a something like a narrative. The last of the package films, it is frequently called, for it shares their essential characteristics: in a time when the company was doing anything it possibly could to save pennies, this compilation allowed them to release material already produced in a somewhat more elegant manner than the frequent re-releases of established classics that had long since proven to be one of Disney's surest revenue streams. 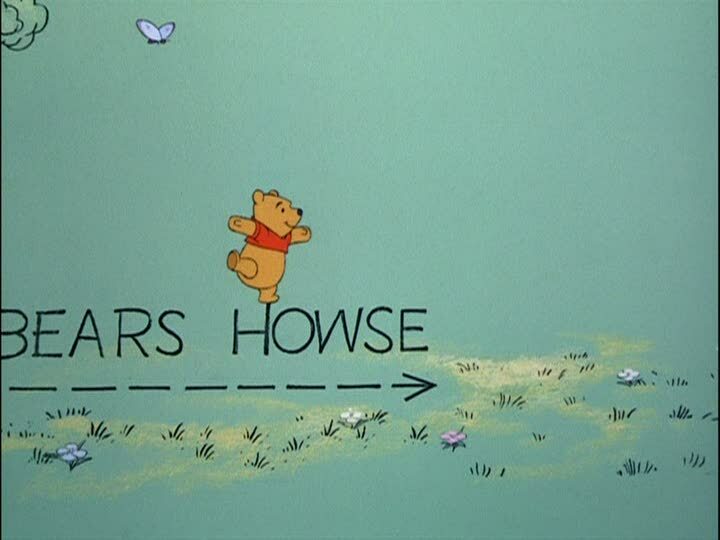 There is some indication that Walt Disney had intended all along that an eventual Pooh feature should be assembled as this one was, so perhaps it's not as desperate a cash-grab as it seems; but unfortunately, the truth of the matter is as unknowable as any history whose primary sources lie exclusively in the depths of the notoriously self-correcting Disney archive. No matter. Whatever its motivation, The Many Adventures of Winnie the Pooh in its 1977 state is one of the most charming of all Disney features, with the added bonus for the animation scholar of providing a convenient microcosm to study the changes in the studio's aesthetic over a rather significant eight-year period. Not that even such a mirthless formalist as I thinks first and above all about how the film functions as a work of art; no, like anyone else, when I see Winnie the Pooh I am swiftly and inexorably carried back to childhood, in accordance with the drippy clichés that Disney uses to market damn near all of its classic pictures. Ever since reviewing Dumbo, I've been intermittently carping about the infantilisation of Disney animation: though there's nothing in any of the features (except maybe for bits and pieces of Fantasia) that is inappropriate or inaccessible for children, who in the main absolutely do form the chief audience for these films, I think it's hardly up for debate that e.g. Pinocchio functions as an artistic statement made by thoughtful adults who wanted to create something genuinely beautiful, while e.g. The Sword in the Stone is a bouncy cartoon that is primarily intended to appeal to youngsters. Can an adult enjoy The Sword in the Stone? Yes, and I did so but half a week ago. Can a child enjoy Pinocchio? Definitely, if by "enjoy" we mean "cower in terror from every fifth image", and this is my point: back in the '30s and '40s, American animation hadn't yet been ghettoised as "kids' stuff", which is why movies like Pinocchio could be made without incident - try to imagine Disney or anyone making the same picture today! In the midst of all my complaining about The Aristocats and Robin Hood, I fear that I've fallen into a most dubious trap, of contrasting "cartoons" with "animation": the former a simple matter of dull entertainment for kids, the latter an artistically vibrant matter for children and adults and every combination thereof. Clearly, this dichotomy isn't fair: the Looney Tunes are nothing if they are not "cartoons", and I'll fight to the death anyone who refuses to admit that the best of those shorts are among the greatest of all American cinema. Here is another case in point: The Many Adventures of Winnie the Pooh is unmistakably and objectively a kids' movie. It assumes an audience that hasn't turned ten yet, and if the viewer above that age can't do anything to switch off the grown-up parts of the brain, that viewer is just going to have to suffer. And despite this, I absolutely love Winnie the Pooh, and will - any moment now - defend it as the greatest Disney movie for many years in either direction. The difference between this and something like Robin Hood is therefore not the intended audience, nor the medium, but the attitude with which the film is created. The three preceding films, at least, have a distinct feeling of calculation about them; they are cynical things, made not out of the filmmakers' love, but out of a desire to make the kind of movie that some platonic concept of a child will respond to. Winnie the Pooh is not one whit more "mature" than any of them, but it is infinitely more honest. It treats childhood and children's entertainment with the greatest seriousness, without ever committing the great sin of talking down to the audience. I still love the film as much in my late 20s as I did when I was a pre-teen, and I think this is the reason why: any film that treats its audience with respect, no matter who that audience is, is a much more lovely and good and lasting thing than any movie that treats its audience like consumers. For some time now, Disney's treatment of Winnie the Pooh, a character set in text by A.A. Milne in the mid-1920s, based upon a beloved toy owned by his son Christopher, has met with no small amount of rancor on the part of Pooh purists (not included among them was Christopher Milne himself, who made no secret of his hatred for the Pooh books in the first place and did not, to my knowledge, give two shits about the Disney shorts), and I am not about to defend the faintly disgusting lengths to which the company has gone in the decades since to secure worldwide ownership of the mere concept of Winnie the Pooh. But setting aside issues of corporate decency, I cannot feel that, even with a heaping spoonful of Americanisation, no filmed adaptation of the Pooh stories could have been truer to the source material than this, arguably the most faithful of all Disney adaptations. Part of that faithfulness included the unabashed child's-eye view of the world that Milne adopted in his prose and poetry. Whatever cosmetic changes Disney made - or in some cases, substantive narrative alterations - that purity of tone, which defines the ethos of Winnie the Pooh, remained intact. The first of Disney's Pooh stories, Winnie the Pooh and the Honey Tree, is the clearest example of what I'm referring to. It tells what has become, I think, the elemental Pooh story - that which is most readily remembered by the most people when the name "Winnie the Pooh" comes up - Pooh's attempt to steal honey from a colony of bees, by covering himself with mud and floating up on the string of a helium balloon, having theoretically disguised himself as a rain cloud. Christopher Robin - the character based upon Milne's son, who came to regret it so desperately - immediately recognises that this is altogether silly, but there is a fine line between "this is silly because the bees will not believe it" and "this is silly because a bear can't float on a helium balloon", and the distinction is a key one. Even before this crops up in the movie, we've been gently eased into a surpassing juvenile way of looking at the world, from the first of many silly-cutesy neologisms, "I'm rumbly in my tumbly" and Pooh's regard of his reflection as a distinct personality, not apparently caring that his reflection never actually responds to any direct inquiries. 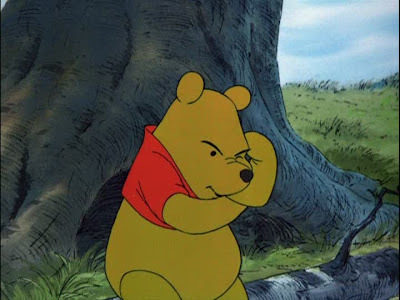 There is a mad genius to this Pooh, present in the Milne and fully brought out in Disney's treatment: he is dim enough that even the smallest child will be able to feel smarter than he is, but at the same time so entirely harmless and good-natured, even in his ravings for honey, that no-one could help but like him. I can think of no character in filmed media to compare him to, except for Big Bird from Sesame Street. 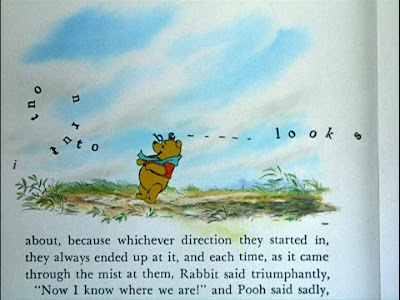 This isn't just a writing thing, that makes him so lovable: Pooh is also beautifully designed and animated, loosely based on E.H. Shepard's original illustrations (particularly in his eyes, represented by small black dots), but with an added expressiveness and personality unique to the gifted mind of directing animator Frank Thomas. 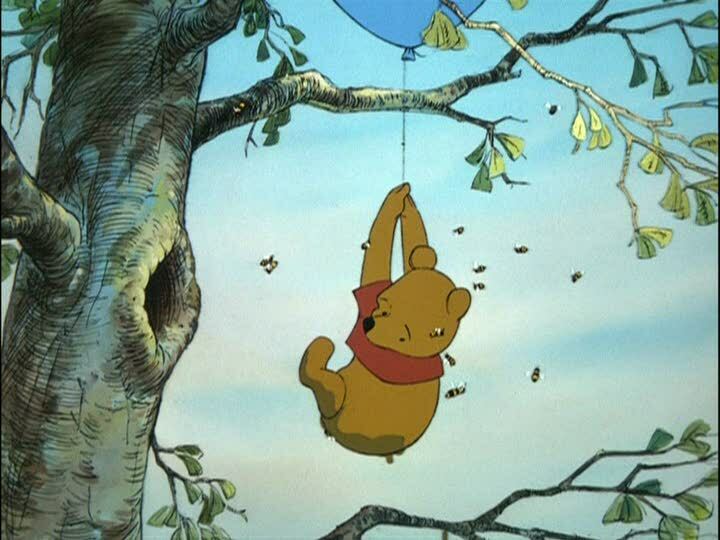 For a bear with virtually no definition to his features, Pooh is quite a miraculously flexible character: the way his face scrunches up when he is thinking, the way that his whole head seems to take part in his smile. This is the very stuff of character animation. 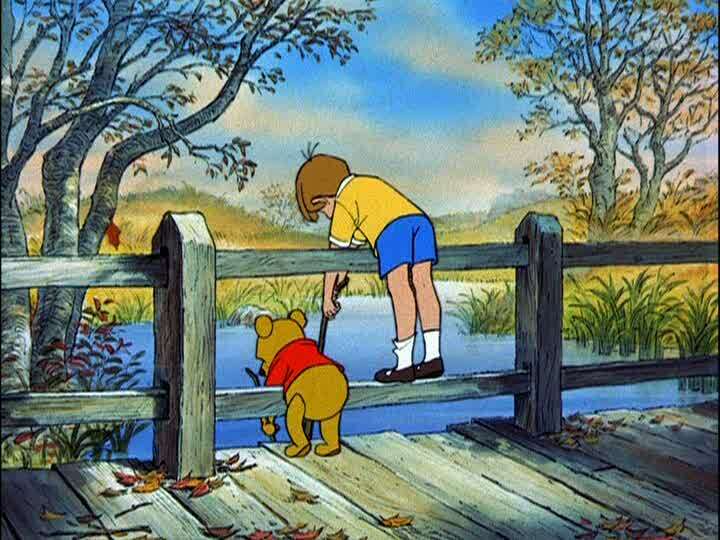 And it is all founded on the greatest performance in the career of Disney veteran Sterling Holloway, whose natural inclination towards the sardonic and dry was completely avoided in his vocal portrayal of Pooh: he captures the sincerity and enthusiasm of a very naïve young person (that is to say, bear) with sensitivity and humor. As the story progresses - actually, hold that. The story doesn't progress as much as all that. The Many Adventures of Winnie the Pooh maybe be made up of three shorts, but those can be readily broken into two only vaguely-connected sequences each, meaning that this 76-minute film is at heart a collection of six stories, none of them longer than 15 minutes (if we do the math, the average is a bit more than 12m30s). This is as important as anything else in the telling of the story of Pooh, for the incidents in the film are not such weighty matters; like most things in the life of a child, they seem very important only for as long as they are actively occurring. Have I mentioned before that I dislike episodic narratives? Better to say maybe that I dislike them when they are done poorly. Here it is done immaculately well. As the film progresses, we move into the second part of Honey Tree, which is just as innocent and sweetly simple as the first. Pooh visits his good friend Rabbit (Junius Matthews), eats all his honey, and gets stuck crawling out of the front hole of Rabbit's burrow. The solution? He must not eat until he gets thin. That's the part that always kills me, the matter-of-fact way that Christopher Robin (Bruce Reitherman) pronounces this sensible advice. In the guilelessness of youth, that does make sense, as does every other bit of logic presented in this first third of the feature. 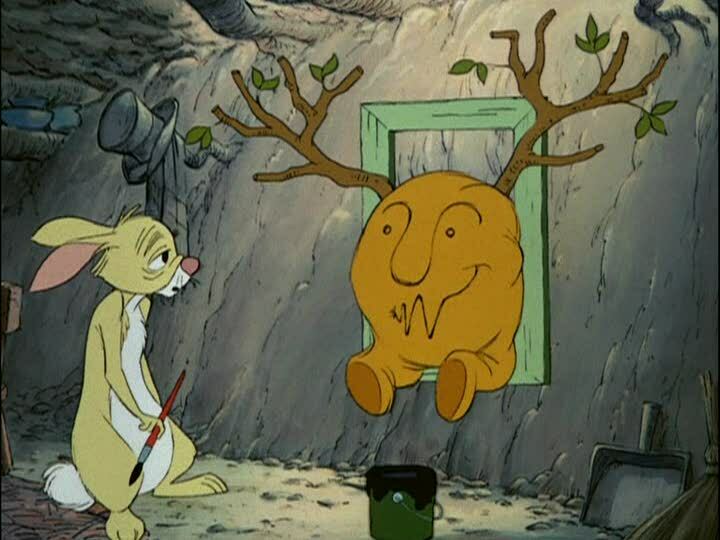 This sequence also includes one of Walt's personal favorite moments in any of his films, when Rabbit draws a moose onto Pooh's engorged posterior, hoping to fool himself into thing that it's a piece of decoration, and not a stuck visitor. The juvenile sensibility that dominates this first segment is also reflected in the sheer number of songs the Sherman Brothers packed into its tiny frame: it is, inch for inch, the most musical Disney film outside of Fantasia and its poor cousins from the later 1940s. And quite an absurdly wonderful set of songs they are: the title theme might well be my favorite song in the Shermans' whole career, including their amazing work in Mary Poppins. My point being, an emphasis on nonsensical singing is a narrative dead-end, but as an exploration of Pooh's primal innocence, it is everything. Produced in the period between The Sword in the Stone and The Jungle Book, it is hardly surprising that Honey Tree shares their scratchy aesthetic; but it utilises that style far better than either of them, almost as well as One Hundred and One Dalmatians. Like that film, Honey Tree solves the problem of the lower detail of xerography by commensurately changing the style of the backgrounds; they are inked with heavy, graphic outlines, to look as much like the line-drawing illustrations of the Pooh books as possible, and it matches the character animation perfectly. The effect is not at all a "moving illustration" in the Snow White and the Seven Dwarfs mold, even less a "moving painting" like Pinocchio or Sleeping Beauty; it is like a moving drawing, where the pencil marks are not simply an unavoidable fact of life, but a deeply vital part of the whole aesthetic. If Pooh and his friends sometimes look like pencil sketches with color splashed on them, well, their whole world is on the pages of a book - all three shorts in The Many Adventures of Winnie the Pooh take the Disney trope of a storybook opening to usher us into the world of the film to its logical extension, by having the action of the film take place within a very physical book that the characters interact with, jumping across the spine, complete with a pleasant narrator who sometimes interacts with the characters (this would be Sebastian Cabot, that marvelous voice actor, who retired after completing the third Pooh short and the feature's framework). I think it worth mentioning that, unless I have unaccountably forgotten something, only The Jungle Book and Robin Hood used the opening book image after Honey Tree premiered; there would not be another Disney film to do so after the Pooh cycle was complete for many years. The second short, Winnie the Pooh and the Blustery Day, followed hard upon The Jungle Book, and for my tastes it is without doubt the best thing produced by Disney in the 1960s (it won an Oscar; how the other two failed to match it - the first one wasn't even nominated! - is a question for the ages). The charming meta-humor introduced in the first short, with the physical book as a stage for the action, is continued and improved upon; for in this film, the letters in the book are subject to the same environmental conditions as the characters. And since it is a rather windy day when this story takes place, and then a windy night, and then a rainy night, there is plenty of opportunity for the lettering to blow or drift or run in the water. Above and beyond being a nifty and singular gag, this speaks to a level of imagination rarely equaled even in the Disney Studios. And if it's possible, the rest of the animation is an improvement on Honey Tree: I am not terribly thrilled about the new coloring (Pooh's shirt is an alarming shade of primary red now, not the pleasant muted red it was before), but the use of pencil shading in characters is something I don't think appears anywhere else in Disney, particularly in the case of... hold on, I haven't introduced him yet. Storywise, Blustery Day doesn't really advance much on Honey Tree: they have the same very gentle humor and child's logic and the non sequiturs that come from it. And good for Disney - when you have a perfect formula, it's well not to muck with it. Ask New Coke. But there is an especially important addition made, besides the interactive text: two new characters, both taken from Milne (there is only one Disney-created character in the movie, in fact: Gopher, who appears in the first two segments, and speaks with the same lisp as the beaver in Lady and the Tramp, though he is not voiced by the same man - Howard Morris, in this case - his refrain "I'm not in the book" is one of the few truly self-referential gags in Disney's canon). 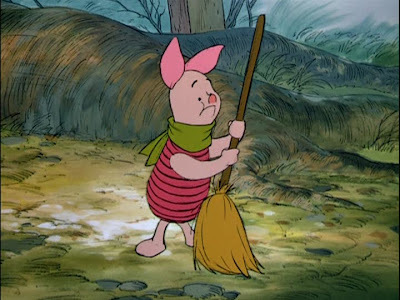 One of this is the fragile, magnificently nervous Piglet, voiced by John Fiedler, gorgeously representing everything uncertain and terrifying about childhood: the fear of the unknown, the worry about what it means to go forward and grow up. The other character is Piglet's exact opposite: absolutely sure of everything, even when he's dead wrong, afraid of nothing, completely unconcerned about anything serious. 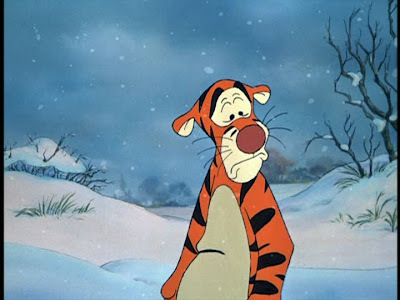 Personal bias time: in all the history of animation, Disney or other, American or not, Tigger is my favorite character. Played by veteran voice actor Paul Winchell in the kind of performance that single-handedly proves how much better people who voice cartoons for a living are than randomly-chosen celebrities cast for their name value, Tigger is a triumph of personality, the very paragon of thoughtless bravado expressed without malice, the very spirit of anarchic play. He is one of the greatest achievements in the estimable career of Milt Kahl, who wrings every scintilla of expression from the character's simple, largely empty features, much as Thomas did with Pooh - my God, but Thomas and Kahl were a well-matched pair of titans in the Disney animating department! Has anyone ever come so close to their perfection of the Disney style? Tigger's fullest range of potential is explored in the third segment, which I'll turn to shortly, but as long as I am speaking of the character I must express my admiration for the end of that short, where he is confronted for the first time with loss: the loss of his spirit of fun in the face of the fussy, mature Rabbit. 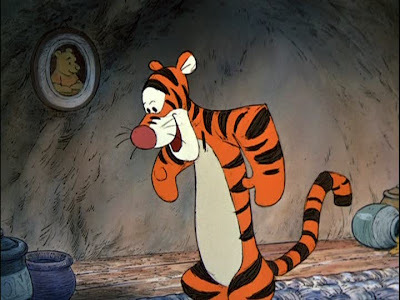 Winchell's vocal expression of Tigger's uncomprehending disappointment, married to the comically overwrought but still deeply touching look of sorrow on the cat's face, is one of the all-time finest achievements in the history of character animation. Tigger also has one of the finest details of any character made during this epoch of Disney animation: his stripes are filled in with a quick shock of pencil lines, giving them just a bit of texture and shading. It must be said that Tigger also introduces us to the unpleasant world of recycled animation in The Many Adventures of Winnie the Pooh. I doubt it's so noticeable when the shorts are separated, but there is a great deal of footage re-used between the three shorts: Honey Tree and Blustery Day both end with the same parade, all three films feature the same animation of Christopher Robin climbing over a fence (the tell-tale detail is Eeyore the donkey, who looks up in a very particular way in the first two instances), and above all, the number of times that Tigger launches into exactly the same dance is kind of appalling. And yet, I don't mind it, again because of that childhood thing: to me, this reads as the enacting out, over and over again, of a certain kind of play ritual, in which Tigger does a certain thing the same way always, because that is what Tigger does. There must be some reason it doesn't bother me, at any rate, and I can't come up with a better explanation. The final short, Winnie the Pooh and Tigger Too!, is the only one begun after Walt's death; it came out a year after Robin Hood. And it is, sadly, the least of the three - though it would still be by far the best work done by the studio in the preceding ten years, if it stood alone. The animation is not so detailed: in particular, the marvelous use of pencil marks a shading element, both in the backgrounds and in certain character details (especially Tigger's stripes) is gone. And the plot is the least interesting of the three films, particularly since Pooh himself is sidelined for such a long time (something the narrator warns us about, to Pooh's chagrin). At the same time, there is still most of the innocence left intact, particularly in the deeply Poohvian details of a walk through the woods at night, when the sound of his honey pots can call his tummy home, away from the mysterious walking sand pit that they always seem to stumble across. To steal a metaphor, this is a triple not a home run: and if it looks somewhat cheap, it has nothing on The Aristocats or Robin Hood in that respect, and shows off, maybe, how much better work an animator does when he is given something to work with that he feels strongly about. As the final expression of one of the last projects Walt Disney started, it is easy to see why it inspired passion and a sense of direction, even in the heart of the '70s interregnum. 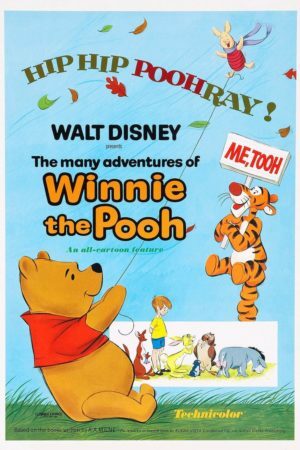 (I say "final"; yet of course there was still 1983's Winnie the Pooh and a Day for Eeyore - by my opinion a much lower project than these three, lacking as it did Sebastian Cabot and Sterling Holloway and the classic era animators; still enjoyable in its own right, but very minor. Then there is the even more distant matter of the quarter-century-later sequel). And thus it ends, with a tiny little epilogue that manages to capture the moment that a child becomes a little bit older with the advent of school, in a manner that is touching and tender, but not at all sad; because sadness is something that could never exist in this placid vision of the Hundred Acre Wood. The Many Adventures of Winnie the Pooh is not perfect, but I think it is one of the great examples in the canon of the Disney dictum that the first thing is the characters: they must capture the audience's affection and sympathy, and gags and story will proceed from that. Top to bottom, the Winnie the Pooh cast - and I feel terrible for not evening naming some of them! - are appealing and warm indeed, and even without Disney's unstoppable marketing machine, it's not hard to see why Pooh currently reigns as the best-selling character in Disney's stable: more than Mickey himself. For he is a truly wonderful evocation of all things right about childhood. I know that I am not alone in being glad for my own sake that somewhere, a little bear will always be waiting.